There have been a number of attempts to answer the seemingly simple question – will this plant grow in my garden? Different researchers and scientists have devised various schemes based chiefly on the weather data which is routinely collected at hundreds of weather stations across the country. They all wanted to be able to predict whether or not a plant would survive in a certain area and they knew that a major factor is the ability of a plant to survive low temperatures. So by mapping weather records across the country they hoped that it would be easier to answer this question. A number of systems have been devised, some of which have disappeared while others are still in use. Today the most widely used system is the one first published in 1960 and developed for the United States Department of Agriculture (USDA) by Henry Skinner, the Director of the U.S. National Arboretum at that time. The original map divided North America into 10 zones, based on the average of the lowest minimum temperature reached each year. Skinner looked for the lowest temperature recorded each year and then averaged that for the period 1940 to 1960. Each zone covers a difference of 10 degrees, so zone 5 for example includes all areas where the average minimum temperature is between minus 100F and minus 200. This means that on average, if you live in zone 5, the coldest night in winter will not be colder than minus 200. Of course you may in fact have winters where it never reaches that low a temperature and others where there are nights that go below minus 200, but probably not by very much. Remember that plants are not affected by wind-chill, so only by the actual temperature is important. Of course this is not much help if you don’t know how hardy (or not) a particular plant is. Fortunately over the years gardeners have kept records and tested plants, so that today we know pretty accurately the lowest temperature that a particular plant will tolerate and this information is often listed along with other information like size and the type of soil preferred. When you look at the descriptions of plants we sell at The Tree Center you will always find the coldest and warmest zones in which a particular plant can be successful grown. So when you are browsing and choosing plants, you will find it much easier to make that choice if you already know your zone. That way you will be able to use the full range of plants available for your area and have the best garden possible. This simple tool will open up all sorts of possibilities for exciting plants that will make your garden special and filled with happy, healthy plants. The USDA map has been periodically revised and updated based on recent records. Interestingly, it was revised in 1990 to reflect the fact that during the 1970’s and 80’s there were significantly colder winters than there had been between 1940 and 1960. Recently the map has been revised again, and the current 2012 version reflects the fact that it has been significantly warmer on average in the winters since 1990. The USDA specifically states that since the maps represent “30-year averages of what are essentially extreme weather events (the coldest temperature of the year), changes in zones are not reliable evidence of whether there has been global warming”. The current map is divided into 13 zones, with zone 1 being the coldest and zone 13 being the warmest. Zones 1 and 2 are only found in Canada, and zones 12 and 13 only in Hawaii and Puerto Rico, so everywhere in the continental USA is in zones 3 to 11. Zone 3 is only found in the northern parts of Montana, North Dakota, Minnesota and in the Rocky Mountains. Zone 11 is only the tip of Florida and Santa Catalina Island. So for almost everyone, zones 4 to 10 are the important ones and where most people live. The quickest way to find your zone is to enter your zip code and you will immediately be given your zone. You will notice that after the number, the letters ‘a’ or ‘b’ will be shown. These indicate if you are in the warmer or colder parts of the zone. Part ‘a’ is the colder part, and ‘b’ the warmer part of each zone. This is useful if you are looking at plants where you are in the coldest zone listed. If you are in the ‘b’ part, you should definitely have no problems, but in the ‘a’ part of your zone you may be more likely to have an unusual winter that is too cold for the plant, although generally it will be fine. You can also look at a detailed map of your state, which can be helpful in seeing if you are at the edge of a different zone or not. The hardiness of plants is a complex thing, and simply looking at the lowest temperature is perhaps a bit too simple. There are several things that can make it possible for plants to survive in cooler zones, or die in warmer zones than they are listed for. As the nights get cooler in fall, this sends a signal to plants to become dormant. So growth stops and deciduous plants will shed their leaves and enter a resting state. Evergreens just stop growing and their buds go dormant. Entering this state takes several weeks, so if the weather stays warm right into late fall, and then there is a sudden Arctic blast, buds that normally would be able to withstand these temperatures if they were fully dormant, will be killed by the sudden onset of cold weather. Gardeners call this an ‘open fall’, when growth continues late and then winter suddenly arrives. In those years normally hardy plants can be damaged. Another factor to consider is this – all plants are sensitive to cold when they are growing, so a tree that can withstand minus 400 in winter when it is asleep will be killed by plus 250 when it is growing. This applies to every plant, hardy or not. Obviously if plants ‘woke-up’ as soon as it got a little warmer they might be tricked by a warm spell in winter into starting to grow, only to be killed as soon as winter returned. So, plants need a certain number of weeks of cold before they can start growing again. If you take a branch of Forsythia indoors in December nothing will happen, they need more cold. However, if you do this in February the flowers will open and bloom, because they have had all the cold they need. Every plant is different, but 12 to 16 weeks is the usual amount of cold needed. Some plants would be fine if they stayed asleep long enough, but if they wake up too soon, a late spring frost may kill them. For example, the Jane Magnolia flowers well in zone 4 because it is slow to awaken in spring, while other Magnolias start to grow early and there flowers are usually killed by a late frost. Another factor is snow cover. If you are in an area that has reliable snow cover all winter most years, then many plants that are covered with snow will not experience especially low temperatures since snow is such a good insulator that it traps the warmth from the ground and protects your plants from the severe air temperatures. Of course this works best for low plants, like perennials, but it also works so you can grow Black Knight Butterfly Bush or Pink Velour Crape Myrtle in zones much colder than their normal range, since they will sprout from close to the ground where the snow has protected them and flower on new growth. This also applies to plants like the Double Knockout Rose. Finally, if you are growing plants in their coldest zones, or want to try them where they are not usually recommended, there are things you can do to help them survive. The leaves of evergreens may turn brown in winter because the frozen ground does not let them take up enough water to keep their leaves healthy. This can be prevented by using a garden anti-desiccant spray which will coat the leaves and prevent water loss. The effect is often remarkable on plants like Azalea, Rhododendron and Holly. The trunks of young trees can also be damaged by the sun warming them on a cold, sunny day. When the sun sets the trunk freezes very quickly and this can cause damage which will show later as dead bark. Young trees newly planted in cold areas can be protected by tree wraps, a strip of corrugated cardboard, or even a coat of white paint. 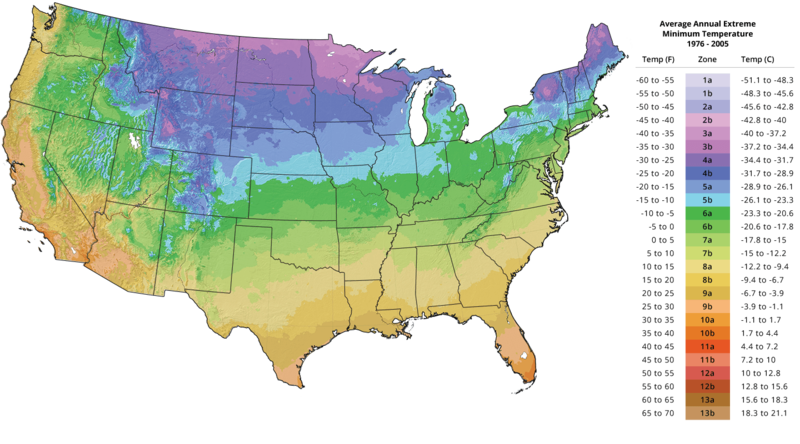 So knowing your USDA hardiness zone, what it means, and how it can help you choose the right plants for your garden is an important step in making the best choices and enjoying the full range of plants that are just right for exactly where you live.